Some folks we met at the campground asked for this item. They didn't want to have their name on the board but still wanted to extend a warm welcome to their site. This 8x18.. This 8x18 wooden sign packs easily @ 2 pounds and welcomes guests to your cabin or campsite. This is actually a replica of our own camping sign. You can choose .. This little oval house number wooden sign works perfectly to display your house number and looks great! Size is approximately 7.25 x 17.75 x 1" thick. carved one side in re.. This little wooden tag sign works perfectly to include your "best friend" at home, cottage or campsite. Size is approximately 11 x 2.75" carved one side or both, in red ced.. This little oval house number poly sign works perfectly to display your house number and looks great! Size is approximately 7.25 x 17.75 x 1/2" thick. carved one side. .. 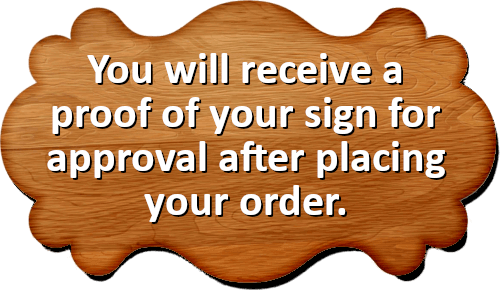 This wooden signboard is carved one side from top grade western red cedar and finishes approx. 10.75" high x 23.75" wide x 1" thick. .. This poly signboard is carved one side and finishes approx. 10.75" high x 23.75" wide x 1/2" thick. You can choose from our stock colors of green, biege or brown. .. 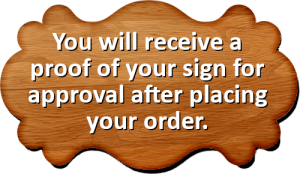 This wooden signboard is carved one side from top grade western red cedar and finishes approx. 7.25" high x 17.75" wide x 1" thick. ..